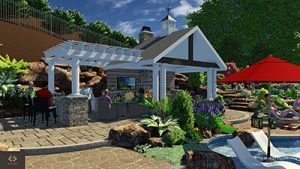 It will be apparent that all the logistics have been thought out and incorporated into your design, including traffic flow, children, pets, and how your landscaping will grow in years to come. We will build a landscape that fits not just your property, but yours and your family’s personalities. You’ll see how our attention to detail pays off. Your property will be a combination of functionality and lasting beauty, uniquely reflecting the family who will use it. It will seem like we have known you for years. To start the conversation, call us at 781-591-0300 or contact Vern Chellberg at vern@ivystudioMA.com to lean how IVY STUDIO LLC based in Massachusetts can transform your property from ordinary to extraordinary with our 3-D virtual reality design renderings.